Unlike the best gaming keyboards or gaming mice, a racing wheel is decidedly niche. That doesn’t mean that the best racing wheels aren’t worth your time – especially if you play a lot of racing PC games. And, while low-end racing wheels might bring back memories of playing cheap racing games in the arcade, the best racing wheels out there can simulate what it feels like to drive a real race car. It all comes down to a feature called force feedback, with a series of motors making you fight with the wheel, simulating what you’d feel when tearing up the track in a Mini Cooper, or whatever your favorite set of wheels is. But, how do you find the top racing wheels? Well, we here at TechRadar have gathered up all the best racing wheels on the market right now. So, from Logitech to Thrustmaster, we’ll make sure you get a racing wheel that’s up to snuff. For years Logitech made virtually the default console race wheels. The Logitech G25 and G27 were crackers. The Logitech G29 (PS4) and G920 (Xbox One) are great too, but are quite similar to those older wheels. That comes with good and bad parts. First, they’re a lot more affordable than the direct Thrustmaster alternatives, the T300 series wheels. The quality of the wheel itself is great too. There’s a metal core and leather stitched over the parts your hands grip. Fanatec and Thrustmaster charge a lot more for leather wheels. The Logitech G29 gets you higher-end extras at no extra cost. Its pedal board is much better than anything else at the price too, with a board that has a clutch and very solid metal plates. It’s not plastic rubbish. There is one reason to prefer a Thrustmaster wheel, though. The Logitech wheels still use a completely gear-based system for their force feedback rather than belts. While it’s very powerful, you can feel this geared effect as you turn the wheel, as its motion is a bit notchy rather than completely smooth. After a while you get used to it, but it makes the whole experience that bit less realistic; unless you drive a Flintstone’s era car it shouldn’t feel notchy, right? The Logitech G29 and G920 are also a bit noisier than the more expensive belt-driven models. The Thrustmaster T300 RS and TX are the ‘default’ enthusiast racing wheels from Thrustmaster, and they’re some of the best around. There’s now an even more expensive T-GT, but as that costs £699/$799 it’s out of reach for most budgets. What makes the Thrustmaster T300 RS and its brothers so easy to recommend is the new force feedback system. It’s not geared, using a series of belts instead, powered by brushless motors. This gives it the perfect combo of power and smoothness, for a sense of realism and immersion you can’t really beat at the price. Any force feedback wheel will add a whole new dimension of fun to reasonably realistic racing games like Forza Motorsport and Driveclub, but at the price these Thrustmasters are the obvious choice. There’s a little gnawing rumble as you fight against the wheel, which is the feel of the motor working, but it’s otherwise great. The belt system does cause a fair bit of heat after a while, necessitating a fan system that kicks in after you’ve been playing for 10 minutes or so. However, it’s not too distracting, and quieter than the Logitech G29 in action. Xbox One owners need to check out the TX set, while it’s the T300 RS for PS4 owners. The dream, of course, is a wheel that works with all systems, but it doesn’t look like we’ll get that with this generation. There are a few downsides to these generally great wheel sets, and it’s all about the parts outside of the wheel base. The steering wheel is solid and very grippy, but uses a rubber grip rather than a leather one. We’ve been using the pictured Ferrari 458 wheel, and the Xbox and PS4-enhanced models are largely similar. Many people will be fine with the material, but after using the G29 we did miss the feel a little. The pedals that ship with many variants of the T300 RS and TX aren’t great either, like the set we’ve been using in the pic. The pedal caps are metal, but this is really just a basic plastic construction, without the stiffness of a great board or more advanced features like a high-end progressive brake. There’s a solution, but it’s not cheap. These wheels are actually part of a system – you can get other steering wheels and more advanced pedal boards, the T3PA and the fab T3PA Pro. There’s even a manual gearbox if you want a proper old-school driving feel. Fresh out of the box the Thrustmaster T300 RS lacks a few of the Logitech G29’s touches, but its force feedback is a lot better. While those with plenty of cash to spend should definitely consider the T300 RS and its brothers, there’s also a lower-cost version that still has many of the same benefits at half the price. For PS4 fans there’s the Thrustmaster T150; for Xbox lovers, the Thrustmaster TMX. They use the same wheel base tech, but have the controls and compatibility chips needed to get on-board with these seemingly picky consoles. So, what are the differences between T150 and T300 RS? The main one is that while the T300 RS has force feedback driven entirely by belts, the T150 uses a combo of a helical gear system and a belt. Predictably enough, then, the effect is half-way between the Logitech G29 and T300 RS. It’s smooth-ish, but not entirely, and you feel the effect of the geared motor as it pulls against you when you take a corner at high speed. Given the price, the results are great, though. The parts that seem a little cheap in the more expensive Thrustmasters are even more budget-y here, though. All-plastic, flimsy pedals are miles off what you get with the Logitech wheel. Their low-resistance action makes them feel like arcade racer fodder, while the force feedback is definitely deserving of the most navel-gazing of realistic driving sims. The exterior of the steering wheel part itself is also all-plastic, without the metal parts that make these wheels seem a bit less toy-like. There are still sports car-like metal spoke shifters behind the wheel, though. A wheel that packs in a lot of substance if not the luxury touch, the Thrustmaster T150 is probably the best budget wheel around. You can get an even cheaper model, the T80, but as that’s not a force feedback model it’s in a completely different, lower league. Fanatec makes some of the best, and most expensive, racing wheels going. The Fanatec CSL Elite is actually one of its more affordable models, made with a mainstream audience in mind, not least because it supports consoles rather than just the PC. As usual there are different versions for Xbox One and PS4, and the Microsoft version is actually slightly cheaper. The force feedback is a level above what you get in the Thrustermaster T300 RS too, even smoother and with a more precise feel, a little faster and cleaner. It’s an excellent wheel base, and also has a rev counter, supported by some games. Fanatec’s pedals are excellent, with seriously tough metal frames and proper progressive brakes, and you can even choose how stiff the brake is. It goes so stiff, in fact, that to really get the most out of the CSL Elite you want a frame into which you screw the pedals. But the price alone tells you this is an enthusiast wheel. Just looking at the Fanatec CSL Elite, you can tell it’s made by nerdy obsessives. After all, who else would choose that funky grey disco ball effect on the base? Not all will love the look, but at least it’s not super-shiny. The included wheel is big, well-made and looks like it could survive the apocalypse. Heck, it wouldn’t look out of place on a Mad Max car. However, Fanatec also makes some much nicer wheels. Like the Thrustmaster wheels, this is part of a system you can upgrade. 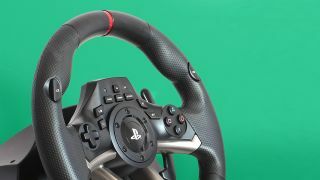 The included P1 steering wheel has rubbery grips and no vibration motors in the thing itself – all the effects come from the force feedback motors. Some of the pricier steering wheels (which you can plug into the same base) do have vibration too, though. You need serious money to get the most out of the CSL Elite, and the basic setup isn’t cheap. But as long as you don’t look too much into what you’re missing with a replacement wheel to avoid upgrade-itis, you’ll be very happy. The Hori Apex/Overdive looks a lot like the other wheels here, but it’s actually rather different. This isn’t a force feedback wheel, relying on rumble instead. Fire up a game like Project Cars and the Thrustmaster T150 will decimate the Hori for quality of experience. However, the Hori is perfect for arcade racers, some of which only have rumble effects rather than force feedback programmed in anyway. The more expensive wheels are lost on a game like Need for Speed. The Hori isn’t. It rumbles when you drift, hit a barrier or car, or go over road markings, but you don’t have to fight with the wheel. There’s a little bit of resistance to turns, and the wheel rights itself when you take your hands off, but there aren’t motors in the base at war with your arms. As a result, the Hori is also much lighter than any other wheel here. You’ll still need something to clamp it to, but this is the one wheel here that won’t seem hard done by if it’s not treated to a proper frame or wheel stand. Clearly made for racers where you’ll use nitrous every 4.5 seconds, it tries harder than the rest to put all the main PS4 buttons at your fingertips; there’s a pair of them right on the wheel rim itself. You can also alter the D-pad to emulate the DualShock’s own D-Pad, or either of the analogue sticks. There are good bits, sure, particularly the lower price. However, the Hori Apex/Overdrive is easily the most toy-like wheel in this group. It has plastic gear shifters, fairly cheap plastic pedals and no parts to upgrade. It also has very limited rotation compared with all the other wheels here, turning just 270 degrees rather than 900 or 1080. This is what Hori was aiming for, though – it's a maker of arcade gear, and this is clearly an arcade wheel. And while the Logitech G29 makes it look like a toy, it’s miles better than the no-brand £30/$50 racing wheels you may have tried over the years.